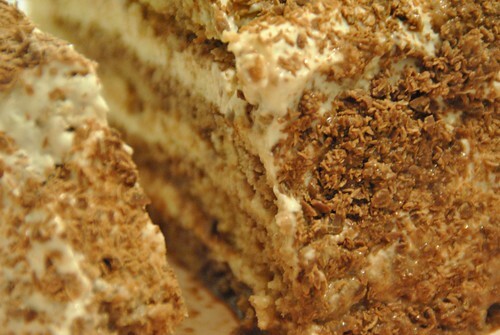 This week on the Great British Fake Bake Off (GBFBO) I will be making no-coffee, no-cream, no-brandy tiramisu. The reason for the fake this week is not laziness for once, it’s that Mr B doesn’t like coffee, neither of us are big fans of whipped cream and I didn’t have any brandy. Instead of the coffee I dissolved cocoa powder into the soaking liquid. Instead of whipped cream I used half fat creme fraiche, a little vanilla essence and less sugar than the recipe states – since the cocoa would add as much of a contrast to the sweetness as coffee would have done. Instead of brandy I used a bit more hot water and the last of some butterscotch liqueur I’d been sent by Fay from Food Fables in a foodie penpal parcel. I didn’t do the tempered chocolate decorations (oh really, what did you expect?) and I found that I didn’t need nearly as much mascarpone and had a lot of the grated chocolate left. I think I over soaked the sponge, as it oozed rather. However, I was rather proud at how well the sponge came out. I definitely would have got point for even layer, if nothing else! Not my prettiest bake..
Preheat the oven to 180C/160C(fan)/350F/Gas 4. 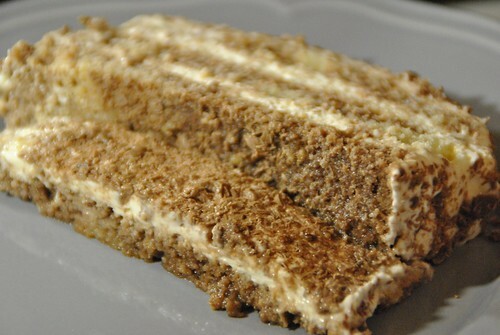 Grease a 38x25cm/15x10in Swiss roll tin and line with baking parchment. For the sponge, place the eggs and sugar in a large bowl and, using an electric hand-held mixer, whisk together for about five minutes, or until the mixture is very pale and thick. The mixture should leave a light trail on the surface when the whisk is lifted. Bake for 20 minutes, or until risen, golden-brown and springy to the touch. Cool in the tin for five minutes then turn out onto a wire rack and leave to cool completely. Line the base and sides of the square tin with long rectangles of baking parchment; there should be plenty of excess parchment which you can use to help lift the cake from the tin later. I just stacked it and wrapped it in foil to chill overnight as I didn’t have the right sized tin. Place the mascarpone cheese in a large bowl and beat until smooth. Gradually beat in the cream and icing sugar to make a creamy, spreadable frosting. Place one layer of sponge in the base of the lined cake tin. Spoon over one-quarter of the coffee brandy mixture. Then spread one-quarter of the mascarpone frosting over the soaked sponge. Scatter over one-third of the grated chocolate. Place the second sponge on top, spoon over another quarter of the coffee mixture then spread another quarter of the frosting over the soaked sponge. Scatter over another one third of the grated chocolate. Repeat with the third sponge and another one-quarter of the coffee mixture and frosting and the remaining grated chocolate. 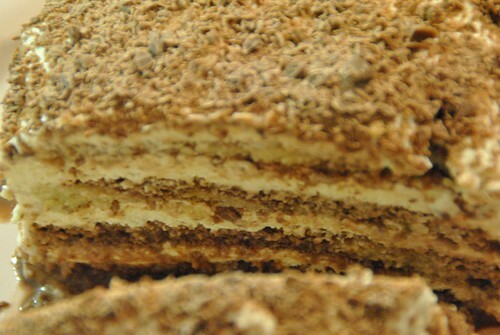 Place the fourth sponge on top and spoon over the remaining coffee mixture. Using a palette knife spread a very thin layer of the remaining frosting over the top of the cake – this is called a ‘crumb coat’ and will seal in any loose crumbs of sponge. Wipe the palette knife and spread the rest of the frosting in a thicker layer over the cake.